The treaty principle that the Crown has a duty to consult with Māori has been applied over several years in dealing with the ownership of the foreshore and seabed. Above, the minister in charge of treaty negotiations, Michael Cullen, and Māori Affairs Minister Parekura Horomia enter Maraenui Pā, Ōpōtiki, in 2008. They were recording progress on consultations with local Te Whānau-ā-Apanui people. 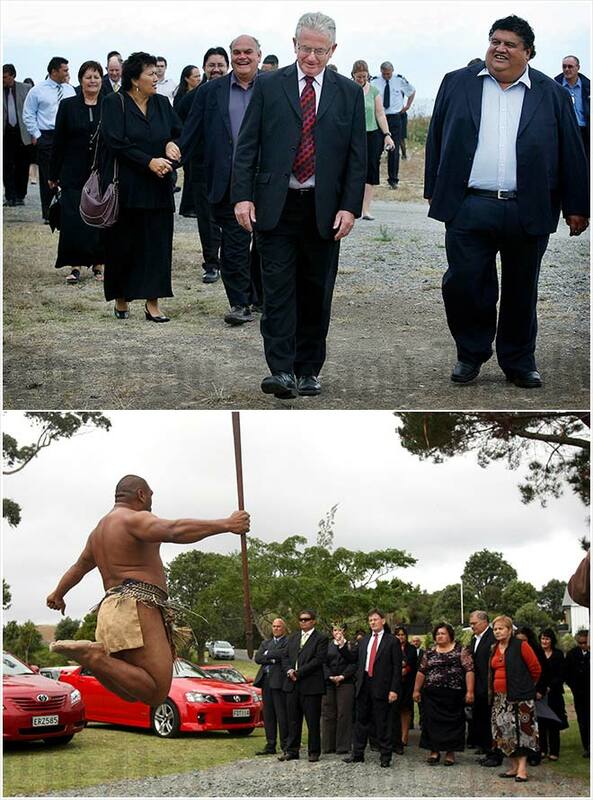 Below, Joshua Wikiriwhi-Heta leaps high during his wero (formal challenge) to Cullen's successor, Attorney-General Christopher Finlayson, at Puatahi Marae, Warkworth, in 2010. Finlayson was attending a hui as part of further consultation on the Foreshore and Seabed Act.